Water Cooling: How to Cool Internal Combustion Engine by Water? Water Cooling is the proven method of engine cooling. To pass some of the heat generated due to combustion in the cylinder of an internal combustion engine, air-cooling or water-cooling methods are used in automobile engineering. In water cooling method, the advantage of superior convective and conductive properties of water is used. Water is circulated continuously through the cylinder with an annular space known as Water Jacket. To avoid unequal expansion in the cylinder bore and burning of lube oil, the water jackets are so designed that they will cover the entire length of the piston stroke. For the cleaning of water jackets in large cylinders, cleaning doors are provided. This method is also employed in large reciprocating air compressor. Where you have to add the cooling tower in addition to cool the circulating water. In this water cooling method, water from a storage tank is directly supplied through an inlet valve to the engine cylinder. The hot water is simply discharged and not cooled for reuse. Hence it is suitable for large industrial units and where plenty of water is easily available. 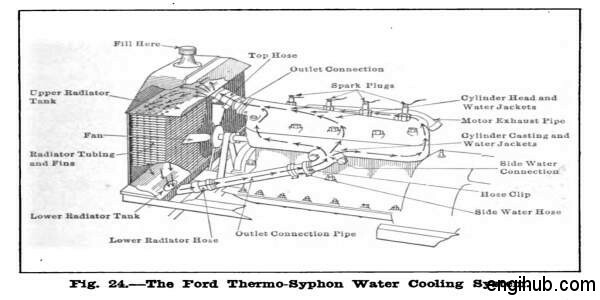 In this water cooling method, hot water from engine cylinder flows towards the radiator. This has comparatively cold water and gets cool down. In order to ensure that the coolest water is always made available to the water jackets, the latter should be located at as low a level as possible with respect to the radiator. This system is used due to its simplicity and automatic operation, but there is a disadvantage of water freezing in cold weather condition. Here the flow of water takes place by convection assisted by a pump. The latter is made non-positive type, which even when stationary; allows the flow of water to take place. If the pump fails water can still circulate on the thermosiphon system. 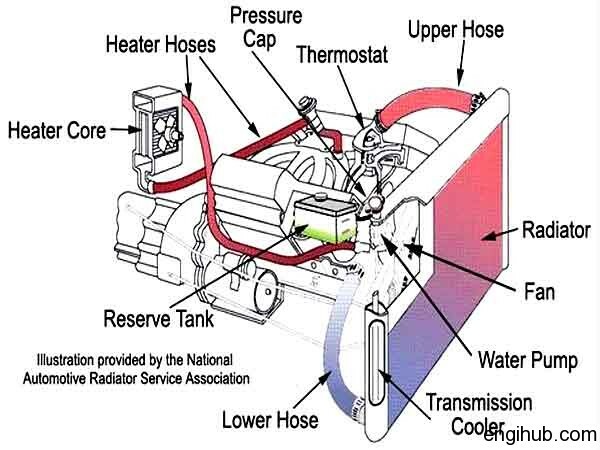 So, in its simplest form, water flows from radiator to engine and back to radiator. A thermostat is employed in the system. This prevents the flow of water below a certain temperature, from the engine to the radiator. This you have to do to acquire some of the temperatures at starting of the engine. In this water cooling method, a positive supply of water by a centrifugal pump placed in the system. This system works on a higher velocity of circulating water due to which less quantity of water is required hence we can use the smaller radiator. In some designs, the piston is cooled by oil squirted against the piston crown underside through a nozzle. Hence this is located in the connecting rod small end. In this water cooling method, the engine may be cooled by evaporating the water in the cylinder jacket. This absorbs a large quantity of heat and rise to the top of the engine from where it flows into a tank at the bottom of the radiator and then flows upwards and gets condensed before reaching the top. Due to a large quantity of latent heat absorbed during evaporation of water into steam. The weight of the circulating water is only 40% of that in other water cooling methods. The hence smaller radiator can be employed. This system is quite useful where plenty of water is not available. The higher running temperature no doubt reduces the friction in the piston but the volumetric efficiency is reduced and the engine is also liable to detonate. Air Cooling: How to Cool Internal Combustion Engine by Air?